NEW JBL SoundPoint Series SP6C ceiling speakers,Pair (off-white) 6.5"
3 out of 5 stars - NEW JBL SoundPoint Series SP6C ceiling speakers,Pair (off-white) 6.5"
1 product rating1 product ratings - NEW JBL SoundPoint Series SP6C ceiling speakers,Pair (off-white) 6.5"
Jbl Professional Ceiling Speaker. Does have a scuff mark. This listing is for one speaker. We have 6 of these, if interested in more let me know and i will give you a deal. Its performance ability ensures balanced sound throughout the listening area. Coaxially mounted 6.5" woofer with butyl rubber surround and 3/4" titanium coated diffraction-loaded tweeter. Wide coverage allows for fewer speakers, reducing the cost of the installed sound system without sacrificing performance. Price is for 1. Good condition. Removed from a Harrah's Casino location. They are operationally perfect. The speakers are not dry-rotted. The install baffles are included. Note these are CV speakers. They operate at 70 or 100 volts. You could take the speakers out and use them in another enclosure. "Speaker Can be Tapped at 30w, 15w and 7.5w"
GOOD used PAIR of JBL AS6 in wall/in ceiling mountable speakers. MODEL NUMBER MARKED ON THIS ITEM IS: AS6. WHAT WAS TESTED ON or WITH THIS SPECIFIC ITEM:Speakers were connected to our test system. WHAT WE FOUND: Speakers work and sound great! JBL Professional Control Contractor 26CT 2-way In-Ceiling Speaker. I will ship separate. I have 2. Each at 200 and I pay for shipping. if you buy both, then you pay for shipping. Used, tested - working condition, sound great! The casing is yellowed and scuffed. See photos for sampling of condition. You are purchasing 2 speakers like those shown on the photo. JBL 8124 Features JBL 8124 Specifications High sensitivity across the product line provides maximum sound level, even at low tap settings. • Nominal Coverage Angle 130 degrees conical. • Sensitivity 93 dB (1kHz - 8kHz), 1W, 1M. Trending at $121.00eBay determines this price through a machine learned model of the product's sale prices within the last 90 days. JBL's 8138 is an 8" ceiling speaker designed for use with a pre-installed in-ceiling backcan, resulting in high-fidelity performance. For use with MTC-81BB8 backcan and MTC-81TB8 tile bridge. Very high sensitivity of 97 dB for maximum sound levels using minimum amplifier power. Item is used. We are unable to test them here. SOLD AS IS. All have a steel strain relief bracket for the wiring, and a steel loop for a safety cable. You get clean, crisp audio, perfect for office installations, surround sound, or a secondary speaker system in another room. JBL engineers have done the hard work, making installation a breeze. The 130-degree dispersion pattern allows you to use fewer speakers, giving you a simpler, less expensive installation! Harman SoundPoint SP6CII Speaker - 2-way. JBL SP6CII New open box. Jbl Sp6cii 2-way Round 6.5" In-ceiling Speaker With Swivel Mount Tweeter (pair). JBL SP6CII 2-way, Round 6.5" In-Ceiling Speaker with Swivel Mount Tweeter (Pair). 0.5" polycarbonate tweeter. 4.5" injection-molded graphite woofer, 1" voice coil. Compact loudspeakers with grilles, backcans, and tile rails for fast installation. We only process orders that are paid in full. Contents are fine. The covers that cover the speakers are included, the y are in the bottom of the box, so not shown. We want you to be happy. Over 20 years experience. Great Service. 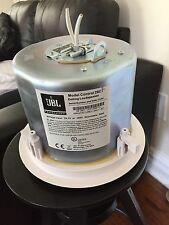 JBL C-6IC 6.5" In-Ceiling Speaker. Authorized Dealer! Introducing the JBL C-Series in-ceiling loudspeakers. Designed with paintable grilles to blend into your dŽcor and crafted for wide sound dispersion, the JBL C-Series loudspeakers feature a modern, virtually invisible design, powerful JBL Signature sound and are easy to install. Optional Accessories: MTC-26NC new construction bracket, MTC-26MR mud-ring construction bracket, MTC-TCD thick-ceiling dog-ears for ceiling thicknesses up to 60 mm (2.4 in, ordering one set = 24 dog ears for 6 speakers), MTC-48TR tile rail for 1200 mm (4 ft) tile spans. Brand New! Factory sealed! Fast Shipping! This item is in good usable condition missing the grille. You are purchasing just the one speaker. It will include phoenix connectors however it will not include the grille. JBL 226C/T Specs. The speakers have a wide 110 degree coverage pattern. They are high power, low distortion, and wide frequency response. (NEW OPEN BOX! )JBL SoundPoint Series SP6C ceiling speakers,Pair (off-white) 6.5"
SP6C Ceiling Speakers, Pair (off-white). One pair Sp6C 2-Way 6-1/2" Round Ceiling Loudspeakers. JBL SoundPoint Series. Never used. Product Information 80 Watts Power Handling. JBL B-6ICDT 6.5" Stereo in-Ceiling Speaker. Authorized Dealer! Speakers Blend In; Your Music Stands OutIntroducing the JBL B-Series in-ceiling loudspeakers. Designed with paintable grilles to blend into your décor and crafted for wide sound dispersion the JBL B-Series loudspeakers feature a modern virtually invisible design powerful JBL Signature sound and are easy to install. White or black (-BK). Two-Way 4" Coaxial Ceiling Loudspeaker. MTC-TCD thick-ceiling dog-ears available for up to 55 mm (2.2 in) ceiling thicknesses. MTC-48TR tile rail for 1200 mm (4 ft) tile spans. Rated Maximum SPL 102 dB @ 1 m (3.3 ft) average, 108 dB peak. Authorized JBL Dealer! Optional Accessories MTC-47NC new construction bracket; MTC-47MR mud-ring construction bracket; MTC-TCD thick-ceiling dog-ears for ceiling thicknesses up to 60 mm (2.4 in, ordering one set = 24 dogears for 6 speakers); MTC-48TR tile rail for 1200 mm (4 ft) tile spans. Pair of speakers for sale. Speakers have been tested working onsite! Speakers have wear from previous use including scuffs and scratches. Speakers only. Quantity listing with reference photo, you may not receive the actual item pictured. Unit is on hand and ready to ship. Please feel free to message us any question you may have. Thank you for checking out our listing. .
Trending at $139.99eBay determines this price through a machine learned model of the product's sale prices within the last 90 days. High-Impact In-Ceiling Subwoofer. Sensitivity 95 dB (near corner), 89 dB (center of ceiling), 1W, 1m. Extended Bass Response with Maximum Impact. Frequency Range 32 Hz - 300 Hz. Elegant design fits any décor. JBL C-6ICDT 6.5" Stereo In-Ceiling Speaker. Authorized Dealer! Introducing the JBL C-Series in-ceiling loudspeakers. Designed with paintable grilles to blend into your décor and crafted for wide sound dispersion, the JBL C-Series loudspeakers feature a modern, virtually invisible design, powerful JBL Signature sound and are easy to install. The 130° coverage pattern allows fewer speakers to provide consistent sound levels throughout a space. JBL C24CT-BK. 7.2" depth from flush ceiling. High power, wide frequency response and low distortion. JBL B-6IC 6.5" in-Ceiling Speaker. Authorized Dealer! Single JBL Control 19CST speaker. New in the box, as pictured. It came as a pair, but only one speaker was needed for the project.